The idea of who is an actual “super” hero was a common theme throughout the Spider Island storyline considering the focal point of the arc was the fact that the entirety of Manhattan was overrun with people who had inherited spider powers – some of which used them for good, and others for evil. But I think the character who best embodied this conundrum – hero versus superhero – was Shang-Chi in the Spider Island miniseries, Deadly Hands of Kung Fu. Deadly Hands was far and away the most unique of the Spider Island tie-ins. Whereas the Cloak and Dagger and Spider-Girl mini-series, and the Avengers and Spider-Woman one-shots took characters with deeply embedded ties to the Spider-Man universe and put them in scenarios that may have felt familiar to regular readers of the web-slinger (i.e. Cloak and Dagger battling Mister Negative and Spider-Girl teaming with Kingpin), Deadly Hands featured a different style of story-telling, one that harkens back to the series’ earliest roots in the 1970s during the kung-fu movie craze (thanks to Bruce Lee). The issues were action-packed, with some stunning illustrations of battlescenes from Sebastian Fiumara and John Lucas, but they came across as far-less character driven than many of the other Spider Island tie-ins. Which is not to say there isn’t a character-issue hidden at the core of this three-part series. While Shang-Chi is the master of kung fu, someone who is talented enough to train a spider sense-less Spider-Man in the art, he does not, by definition, have superpowers. Which means, based on the rules of Spider Island, he was subject to the virus that gives all the non-powered inhabitants spider powers. But do superpowers make a superhero? In this story Shang-Chi rescues his superpowered friend Iron Fist and defeats the relatively new Marvel supervillain Ai Apaec. 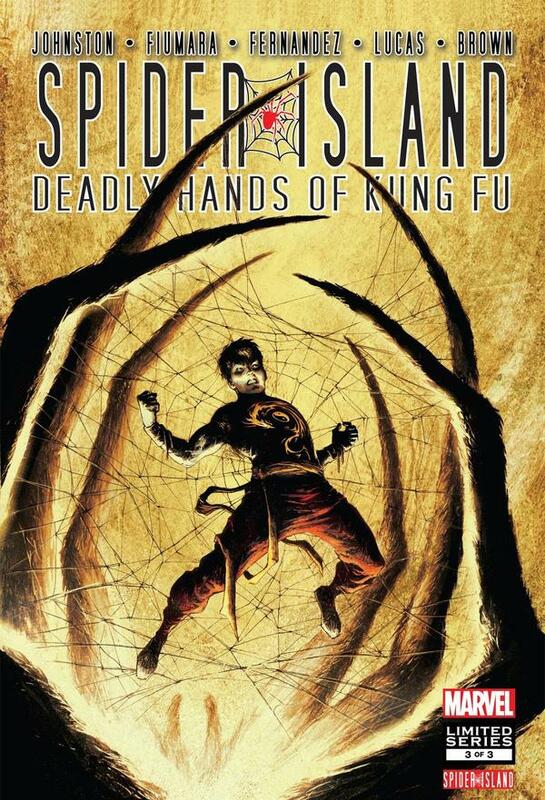 Meanwhile, Shang-Chi overcomes the greatest physical challenge of them all, not surrendering to the spider-plague attempting to overtake his body and hand control over to the Spider Island “Queen.” Shang-Chi declares that master of kung fu serves no Queen, King or God. So how is Shang-Chi not in the most literal sense a superhero? His Kung Fu abilities are at an incredibly advanced level, giving him a physical advantage over characters who actually have mutated or chemically-heightened powers. By refusing to give full control to the spider virus, he demonstrated that he was mentally stronger than at the very least, the vast majority of New Yorkers who were walking around Manhattan during the Spider Island arc as mutated spiders under control of the Queen. While Shang-Chi may not be the most creative superhero in the Marvel universe – which may explain why he’s never achieved any popularity beyond cult status – I certainly think he proved himself in this miniseries that even without specific “powers,” he’s powerful enough, and super enough to stand alongside the likes of Spider-Man and Captain America as a true Marvel superhero. A character shouldn’t need gamma rays or a radioactive experiment gone horribly wrong to be a superhero. Sometimes, the true strength of a superhero comes from what ‘s already inside a character. By channeling that inner-power, a character can demonstrate strength that is more powerful and focused than any mutant.